Casa Toraño appeals to all the senses. The Ecuadorian-Connecticut (or USA Connecticut maduro) wrapper is delicate, silky, and smooth. The binder is especially selected from the Toraño farms in the hills of Nicaragua; and the filler is a combination of Honduran, Nicaraguan, and a family blend of Central and South American tobaccos. Originally the Toraño´s private family blend, the Casa Toraño was made available to the smoking public and has received an enthusiastic reception. So it was the family’s private blend; that’s cool. One could even say it was their “house” blend. Looking at it you wouldn’t necessarily think it was anything particularly special. While it feels uniformly packed and there are a decent amount of oils on the dark brown wrapper it isn’t a smooth cigar. I’ve referred to cigars that look like this in the past as being “rustic” and that applies here. Lots of noticeable veins, some peaks and valleys and there are some stretch marks on the wrapper. This cigar starts out very well with notes of woodiness, mint and an overarching savory sweetness. It’s a good mixture of above average flavors that isn’t abrasive in the least. Usually, when someone makes a point of saying there isn’t anything offensive or “abrasive” about something that is usually immediately followed by some variation of “but it’s boring.” This isn’t a boring cigar as the second third makes some pretty nice progressions. For example, the sweetness and woodiness have melded together very nicely and some mesquite is now coming through. 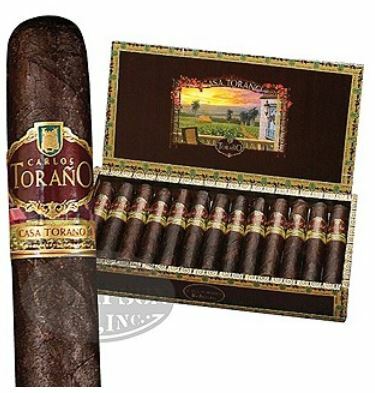 Medium bodied with a good draw and burn; the Carlos Toraño Casa Toraño is an enjoyable cigar featuring primarily savory sweet flavors until that earthiness kicks in during the final third. Interesting cigar and I’m glad that I smoked it.